I enjoy making lunches with fresh seafood because it is quick, light and easy to portion for just one. It's also nice to indulge in a more expensive piece, because I need so little of it. 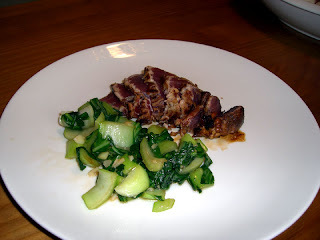 Today's lunch consisted of a small piece of sushi grade yellowfin tuna and a side of stir fried bok choy. 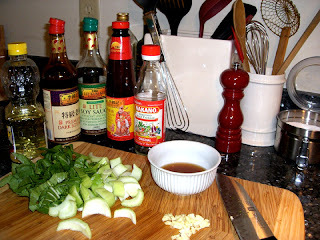 Mix marinade ingredients together and whisk lightly to combine. Coat the tuna with the marinade and leave in the bowl, covering tightly with plastic wrap and and refrigerating for about half an hour. Turn over half way through. Heat a nonstick skillet to medium high heat. When the pan is hot, remove tuna from the marinade and place in the pan. Sear quickly on each side, just long enough to get a nice crust on the surface. Turn the tuna to let all sides get seared. I like the tuna very rare on the inside, so I didn't leave it long, but you can increase the amount of time based on how rare you like it. Clean and cut the bok choy. 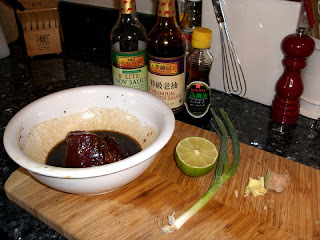 I also like to dissolve the oyster sauce into the water to make it easier to mix in to the dish while cooking. Heat oil over medium low heat and add garlic, letting saute very briefly until fragrant and translucent. Quickly remove the garlic to prevent from overcooking and becoming bitter. Set aside. Increase heat to high and add bok choy, stirring quickly. As it begins to just wilt, add water with oyster sauce and garlic. Mix sauce to coat then season with sea salt. Remove from heat and serve. Forgive the inept plating and photography. I get my soy sauce, sesame oil and rice vinegars from Hong Kong Market in Gretna. Working from home can be lonely and isolating but has definite culinary advantages. I can cook myself a decent lunch or get a head start on dinner. I can go out to eat without worrying about making it back in less than an hour (or harder still, 30 minutes). And... I can take a snowball break. Plum Street Snoball is close and quite good. While not a match for Hansen's Sno-Bliz (my favorite), it does have reasonably fine and fluffy snow and a good Nectar Cream syrup, my latest snowball flavor of choice. I've spent the last 10 years always sticking with my favorite combination: cherry and coconut. This summer, I've decided to branch out and have started trying the cream flavors. Nectar Cream is at the top of the list and is difficult to describe. I had it first at Hansen's as part of a Sundae which consisted of layers of ice and syrup topped with canned cream (I had no idea there was such a thing and if there was, that I'd want to eat it, but it really does work beautifully), crushed pineapple and a cherry. Super sweet but an absolutely craveable winner for me. I'd love to know what Nectar Cream is composed of. There are notes of something like nectarine, maybe a bit of a cherry and then something else that I can't seem to identify. It's fantastic. 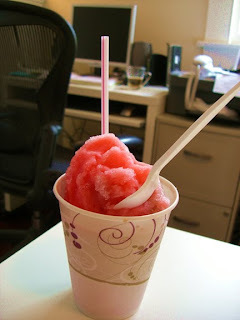 This time, at Plum Street Snoball, I paired Nectar Cream with Orchid Cream because the name was so irresistible. The staff described it to me as a French Vanilla which was a bit of a disappointment, but sounded fine at the moment. I should have known better. There isn't much to be said for fake vanilla. It was far too cloying and not at all to my taste. Next time, I'm heading back to Hansen's to get a taste of their tart flavors. Will report back. I've been in love with La Divina Gelateria for a good while now. 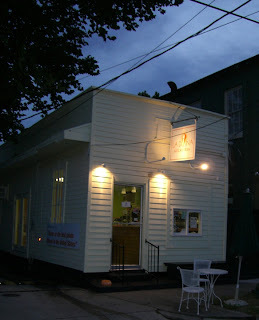 It's no exaggeration to say that in the year or two immediately following Katrina, La Divina is what kept me from going 100% ape and demanding that we get the hell out of here NOW. OK, I did demand that a few times but I was in pain and was acting out. I didn't mean anything by it. Kid Cayenne held me down. La Divina gave me hope. We'd visit every Saturday or Sunday afternoon, just about all year long. I'd revel in whatever the newest seasonal flavors were. Kid Cayenne would stick with her favorite, Creme Brulee. I started to believe that if La Divina (with it's fresh, minimal, lovely interior, it's determination to use only truly quality ingredients and not take the easy way out, it's unsinkable, darling staff and owners) could exist in our dark, post-apocalyptic city, then some how, some way everything would be OK again eventually. And it was. My affection grew miles deeper when, after a trip to San Francisco where I had the divine Salted Caramel ice cream at Bi-Rite Creamery, I begged Carmelo to please consider doing a gelato version. I knew they would do it well and I was having major cravings for it. He said he'd think about it. A few weeks later, I got an email saying that they had made it and to come try it out. Needless to say, their version was exceptional. I later learned that they had been planning it for a while, but I like to pretend it was all my idea. Makes me feel all fancy and such. What can I say about La Divina's gelato? It's heaven. Truly. Totally artisanal, they make it entirely from scratch. It is delicate, refined, frosty and never icy, just the right amount of stretchy. The flavors are well balanced with a wonderful mix of seasonal and year round favorites. It's perfect. I've never been to Italy but when I have a spoonful of Grapefruit Campari melting on my tongue, I can imagine that I am there. Also to be adored are the perfectly made espresso drinks, my favorite being the mochas because, dear reader, they use Valrhona chocolate. Valrhona is queen of chocolates, very high quality and among the best in the world. This is a serious mocha. Deep, perfectly bittersweet, exquisite. *sigh* I am having a tiny fit thinking about it and might have to go over tonight and have one. I don't know what the best method for getting settled into a new house is, but I guarantee I haven't found it. This is absurd, especially considering how many times I've moved in my life (I believe this is number 29 but it may be 30). We have been in the new house for 12 days and are still completely surrounded by boxes, boxes and more boxes. I don't know where they are all meant to be unpacked to, but I do know that I feel less like a new home owner and more like a squatter. We spent the weekend trying to get the last odds and ends out of the old apartment (still not completely done there) and learning about lawn maintenance. I say "lawn" as though we have one, when really it's about a 6x12 patch of grass with some sporadic overgrowth into the gravel driveway. Having only rented in the past, we have not been responsible for our yards and when we were, there was even less to maintain than this, so we are untutored and a bit ridiculous at the outdoor maintenance. Rather than purchase a lawn mower, we opted for a trimmer/edger that we hope will be adequate to keep things in hand. Armed with our brand new Grasshog XP, we spent a couple of hours on Saturday working on cutting back a few weeks worth of grass growth and cleaning out the flower beds. Or rather, that was our intent. What actually happened was some ineffective hacking and divoting. It looks nearly as bad now as it did before. Amateurs. One highlight of the weekend was a quick dinner at my newest restaurant crush, the Chill Out Cafe on Maple Street. We found it the first day we moved in to the new house and loved it instantly. Actually, at first sight, we passed it by (thought the name was goofy and the Thai plus American breakfast concept odd) and walked up to Figaro's but as luck would have it, they were closed so we headed back. What we found was beautifully and properly prepared, very fresh ingredients in a charmingly casual, art filled environment. I am almost always terribly disappointed in the Asian restaurants that we have in New Orleans. I find that they are usually full of overcooked, overly Americanized dishes with flat flavor and heavy, one note sauces. Those that aspire to more are rare and generally too expensive to justify a visit as the quality still doesn't make the grade. Chill Out Cafe is the first place I've found that is both well-priced and well done. On our first visit, I had a Ginger dish with Beef which included the perfect amount of ultra fresh ginger, onion, bell pepper, very nice mushrooms (wood ear, I think) and bamboo shoot with sliced beef and a bit of rice for $8.75 (very reasonable). Kid Cayenne tried lo mein noodles with vegetables and was pleased to find that the dish included a variety of good vegetables that were perfectly tender/crisp as well as nicely sauteed tofu. All of the dishes at Chill Out Cafe can be made with veggies only, making it an excellent place for vegetarians or, in the case of Kid Cayenne, the merely meat squeamish. We also ordered the Thai Iced tea (the first for both of us). The very sweet, creamy, Chai- reminiscent drink was a hit for me but was far too sweet for Kid. This weekend was our second trip back and we are still impressed. 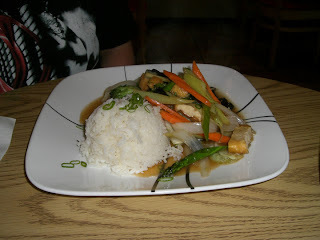 I was determined to try a dish that I heard another diner oohing and ahhing about from the next table on our last visit: the Thai Curry. 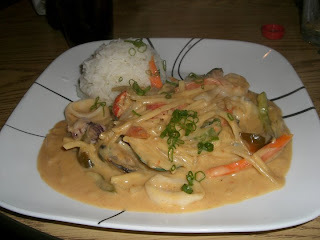 I ordered it with seafood ($10.95) and got a beautiful dish full of prawns, squid, scallops and crawfish in a well balanced creamy red curry sauce that was just sweet and just spicy enough. Basil leaves, onion, peppers, carrot and bamboo shoot rounded out the dish (perhaps a bit too much bamboo shoot, but as it was crisp and tasty, I can't complain). Kid Cayenne ordered a simple vegetable stir fry with rice and was satisfied but not as pleased as she had been with the noodle dish before. 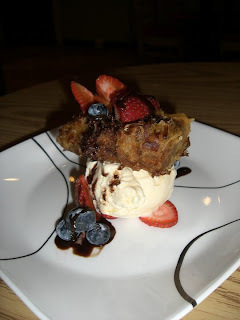 We shared a dessert of Cheesecake tempura over ice cream ($4.75) which we adored. The tempura was made with shredded coconut and was fab. Fresh berries and a drizzle of chocolate sauce were just the right finishing touch. We hope to try the Chill Out Cafe breakfast menu at some point but for now, I'm so thrilled to have found a really good Thai restaurant that I'm certain to exhaust that portion of the menu first. Highly recommended.